Big affect!!! I was at the grocery store today, doing the normal foodstuffs shopping, right? So, I'm loading the bags of groceries into the trunk of my car. ***keep in mind that I am 8+ months pregnant and moving ssslllloooowwwwwww*** Well, as I'm loading the last bag into my trunk, this FedEx guy came up and asked if he could take my cart back for me. WOW! How awesome is that? It's not that I've never had people extend their kindness to me before, but his act of kindness reminded me of the goodness of people and the blessings of God. How wonderful God is! He is all about the good...from the extremely big to the very small! What blessings have you encountered recently? I'd love to hear about them!!! My best friend, Grace, got married the end of August. Congrats to her and her new hubby! I was in her bridal party...that's right, at 7 months pregnant too! The other gal in her bridal party, Sally, made our dresses. She did such an incredible job. I would NOT want to make a dress for a pregnant gal! The dresses turned out great. I hosted her bridal shower at my house and these are pics of the gift I made for her. Of course there are all kinds of goodies in the paint can! I couldn't just give her an empty one now could I? 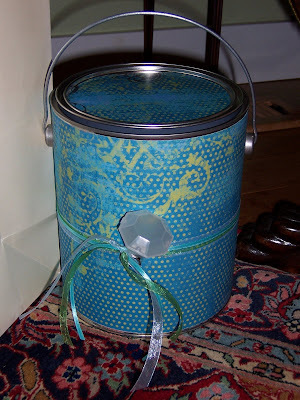 *wink* I used this turquoise blue and green printed paper to decorate the paint can with since her color was blue...royal blue. I know, it isn't royal blue, but I didn't have any royal blue patterned papers without them looking like the 4th of July! The paper is from a stack I got at Costco a little while ago. It was such a great deal! I paid about $13 for a stack of patterned paper about 2" tall! To finish off the paint can I wrapped ribbon around in three colors: white organdy, green organdy and turquoise satin. Tied onto the ribbon is a plastic wedding ring. I got this from Target some time ago. It's actually meant to be a shot glass, but I thought it would look much cuter as a decoration for altered items. The picture doesn't do it much justice, as you can't see the whole thing. I filled the paint can with all kinds of pamper yourself items. I had fun shopping for all these goodies. I know I'm going to forget something, but here's an idea of what was in there: Lip Smackers, bubble bath, nail polish, nail file, pedicure foot bath, foot scrub, votive candle, etc. I had it packed with stuff! The card was fun to make as well. I used the same patterned paper as I did on the paint can. 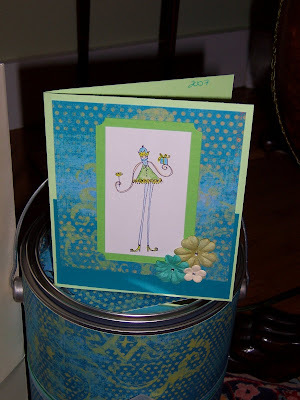 Using patterned paper on cards is FUN! I can see why so many people are big on that trend right now. I takes your cards to a completely different place. the stamp is by American Art Stamps. I think this line of stamps are called Stick Chicks. They are designed by Karen Stolper for American Art Stamps. I colored the image in using Prismacolor pencils. No odorless mineral spirits, just using the pencils and gradating the color to blend together. 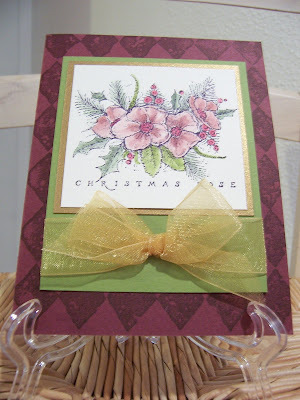 To finish off the card I added some prismas and then I HAD to add some bling in the middle of each prisma flower. Its hard to see the sparkle of each rhinestone, but the little dot in the middle of each one is the rhinestone! When I finished with the card I discovered that it was too big to fit in the standard A2 size envelopes! I had grabbed a piece of cardstock that was what I thought to be the proper size...guess not! It was just a little bit too wide to fit into the envelope. So, this card was delivered without an envie! I need to find a pic of the shower invite I made. I know I took a picture of it...I'm just not sure where it is in my picture files! Hope you have a spectacular day! Tonight DH has a baseball game. His team is in the playoffs, so hoping they do well and have fun! I really enjoy going to his games and supporting his passion for baseball and sports! I made this card some time ago...probably a year, maybe two! It was when I had just gotten Heartfelt Thanks in an order. I didn't have the stamp-a-ma-jig yet either...so lining up the stamps was an interesting feat! Since then I have gotten the stamp-a-ma-jig and boy, is it a lifesaver when using stamps like this! SO easy!!! If you don't have one yet...go get yourself one! Definitely worth the money spent. Oh, the 'faith' sentiment is done using Alphabits. While I think this is a fun little set, I also think its a little cumbersome to use sometimes. It's probably just me, but I get tired of punching out all those little individual pieces to make up one word! It's promising to be a warm day up here. They are forecasting for the mid 80s. I know, it doesn't sound that warm, but when the pregnancy hormones are on full alert anything is warm! The worst part on warm days is that my stamp room is on the top floor (it's a spare bedroom) and it seems to be the one that get the warmest of all the rooms upstairs. I have a little fan that helps, but it doesn't have that great fanning power one would hope for on a warm day. But, at least I have a fan! I've also been working on preparing items for my craft show upcoming the end of November/beginning December. I'm excited!!! The promoter of the show loved the pics of the items I sent her! Major plus! I'll have to share what I'm planning with you and some pics too!